The inspiration process is difficult to document and explain in words or photos. Waves of ideas come at odd times and often are images created in your head and finding examples to showcase an element or idea that does not yet exist is often impossible. Also the connection between the thoughts are so personal, it is hard to explain how you move from each idea to get to the end design. Or maybe I am just not used to explaining my creative process, but here is my best attempt at explaining the thoughts behind my PHS Flower Show garden. The 2019 Philadelphia Flower Show theme is FLOWER POWER, both embracing the power of flowers on emotions, health, and the environment, as well as a nod to the 50th anniversary of Woodstock. I explored a lot of different ideas of flower power, from medicinal to pollinators and food. Most of these swirled around in my head but never made it to a pen on paper exploration. My concept clicked when I saw Yayoi Kusama’s Infinity Mirrors at the Cleveland Museum of Art. The rooms created a personal experience for each visitor, enclosed in a room with only your loved ones, transported to a never ending space was overwhelming. The unknown of what was inside each blank white cube, the rushed feeling of absorbing as much as you could during your 30 second time window, and the emotions of leaving something you felt fortunate being able to experience heightened all your emotions during and long after you left the exhibits. I began to think of other times I felt a similar overwhelming emotion and remembered driving past a vast field of sunflowers in bloom and stooping to walk through, almost fully submerged, in the blooms. All around us were other families and couples, taking photos and admiring the power of one flower blooming. The power of one flower was the catalyst that caused so many people to stop, get out and enjoy. It felt like we came upon something magical and fleeting, if we were a week later all the flowers would have been gone. I also thought of Red Twig Farms‘ peony season opener and watching thousands of shoppers excitement cradling armfuls of peony stems, posting photos to Instagram and buying peony plants to bring a bit of the emotion and excitement home for years to come. 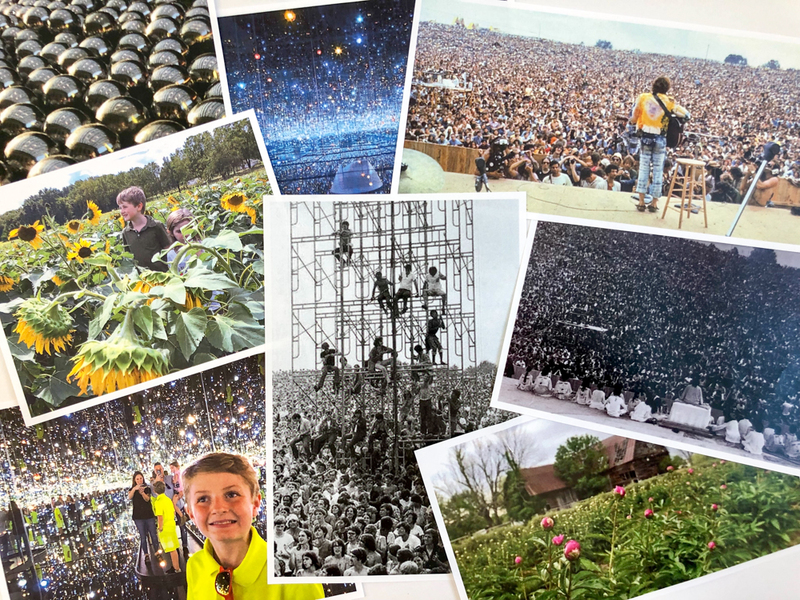 When I placed images of the Infinity Rooms, sunflowers and Red Twig Farms peony fields next to photos taken from the Woodstock stage, the connection between Woodstock and the power of flowers clicked. The first was the visual likeness of the opening meditation during Woodstock with all the faces looking to one focal point paired with the field of sunflowers, with all the flower faces focused on one point, the sun. It connected my emotional experience with flowers with the emotional experience of Woodstock. The infinity mirrors made the viewer the focal point in a boundlessness of space, and again reminded me the photos of the musicians on stage looking out over the vastness of festival revelers. A mass of flowers create an emotional connection to a place and time, personally touch each individual in the crowd and encourages viewers to pause and engage in the moment before it passes. Flower Power. After establishing the “Flower Power” I wanted the garden to convey, I had to figure out how to create a design that communicated and imposed those emotions onto viewers. The foundation of the garden is something you could actually translate and install at home, it is not skewed towards a themed garden or art installation. It is heavy on plant selection for bloom, color and texture, with plants as the hero and structure being a supporting element. It is designed to allow the viewers to go inside to see it from many vantage points with the experience changing as you walk in and out of the garden. Reflection is a key element, drawing upon the classic use of water to create reflection in gardens and is incorporated to be hidden. 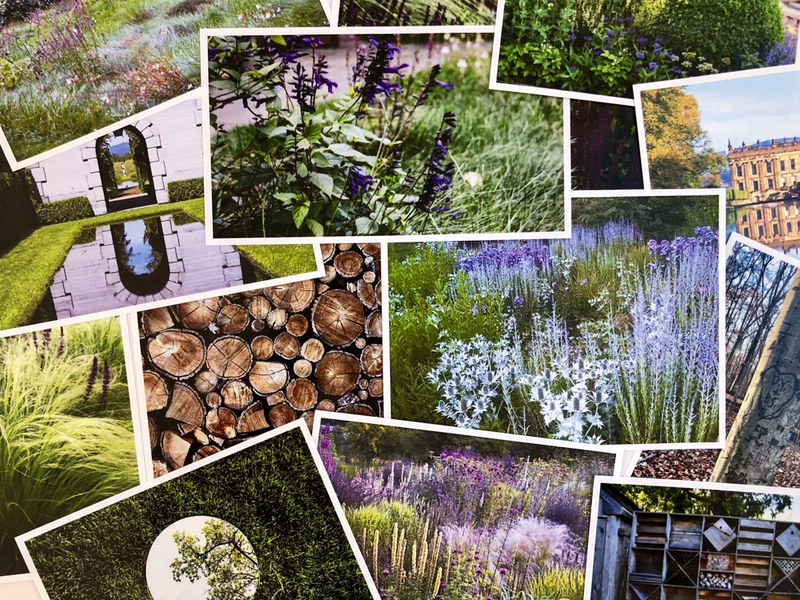 As I worked to create the garden, I kept going back to emotionally connecting individual viewers to bloom, texture and color with each decision. With the flower show just a few weeks away, we are busy getting all the final elements constructed and organized. We are building structures, aligning shipping schedules and talking back and forth with Stoney Bank Nurseries who is forcing the perennials / annuals and planning for the installation. We are partnered with Stoney Bank Nurseries for growing the plant material, installation and providing guidance and knowledge. We are so fortunate to have Joe and Hannah as our partners, leading us through this process. A date that seemed so far in the future is quickly approaching and there are so many details that need finalized and incorporated, the last few weeks will go by fast. I am so honored for the privilege PHS has given me, I want to make sure the garden matches the PHS and Flower Show’s reputation. I will share more details of the process in blog posts, but will save sharing the complete garden design until after the show. There is so many details about forcing the plants, designing for the viewers experience, trying new techniques to share leading up to the show. Plus I am working on a video of the complete process to share, I have learned so much during all this I want to share the experience. This entry was posted in G A R D E N S, GARDEN DESIGN, Inspiration and tagged Cleveland Museum of Art, Flower Power, garden design, garden inspiration, gardens, landscape design, Ohio, Philadelphia Flower Show, Philadelphia is America's Garden Capital, PHS Flower Show garden, Plant Combos, Red Twig Farms, Stoney Bank Nurseries, Woodstock, Yayoi Kusama's Infinity Mirrors by Nick. Bookmark the permalink. Thanks so much for sharing your thought process Nick! When I placed images of the Infinity Rooms, sunflowers and Red Twig Farms peony fields next to photos taken from the Woodstock stage, the connection between Woodstock and the power of flowers clicked. Amazing the power of images to connect the dots. See you there Nick! Thanks for sharing this.